Two 6L6, 40W. Classic BF AB763 circuit, two channel, with vibrato and reverb. Thank you for your interest in Weber Amplifier Kits. We would like for you to read the following information so you are aware of some of the issues involved with building an amp kit. • We provide a layout and a schematic (on the Technical Details tab), but we do not include step by step assembly instructions. • Troubleshooting advice can be found in the Kitbuilding Forum. • Kits with cabinets ship as one complete shipment. • Lead time for kits is approximately 2-3 weeks. 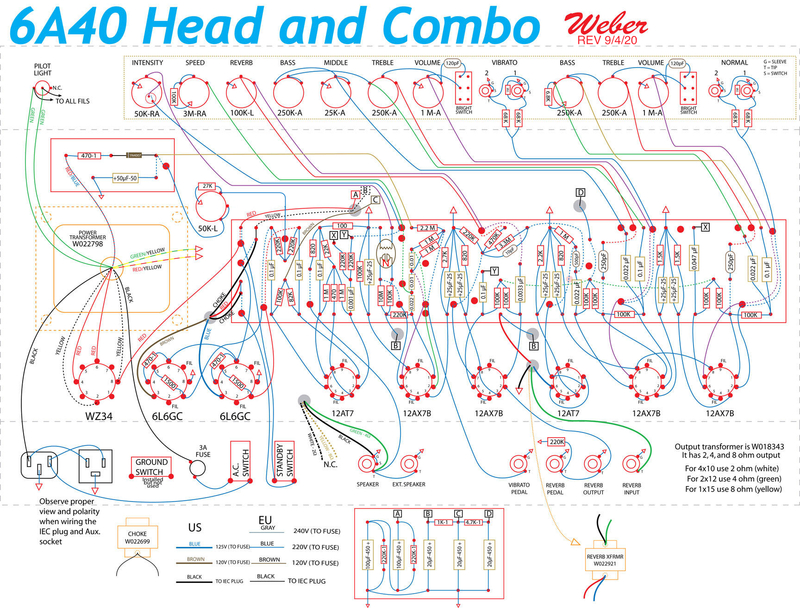 Please Read: The complexity of Weber kits ranges from very simple to extremely complex. We do not recommend anyone attempting to build any of our kits that are rated at 3 or higher in complexity unless you have the assistance of a qualified amp builder or electronics technician. Because of the sensitivities to wire placement, grounding schemes, and other parts related issues, troubleshooting the potential malfunctions and noises can be very frustrating without the experience and knowledge. All Weber amplifier kits have lethal voltages that are present even after power is removed. You must exercise extreme caution when working with high voltages. Before ordering any of these kits, you should look over the schematics and layouts provided for each kit to ensure there is enough information for you to feel comfortable building the kit. Click here for an explanation of complexity ratings. "Hey guys, these kits aren't Lego™ sets. They require some thought, experience, and the correct tools. If you do not think you have the time, ability, nor tools to do this, maybe this isn't for you right now. If you still want to build one of our kits, but are a little uncertain, please enlist the aid of a qualified tech." -- Ted Weber. FINE PRINT: Weber kits are sold only with the guarantee from the buyer, builder, and subsequent seller that no trademarked names or company logos other than Weber or the builders name will be placed anywhere on the kit. By clicking the submit button on the order form, the buyer is certifying his or her compliance with this agreement and guarantee. Failure to comply may result in legal action by the owner of the logo or trademarked name. Buyer agrees to absolve Weber of any legal liability which may result from noncompliance of the agreement. NOTE: This kit must be shipped with signature required for delivery. 1st Weber kit build and am very happy. Perfect for home use and with careful handling gig worthy. 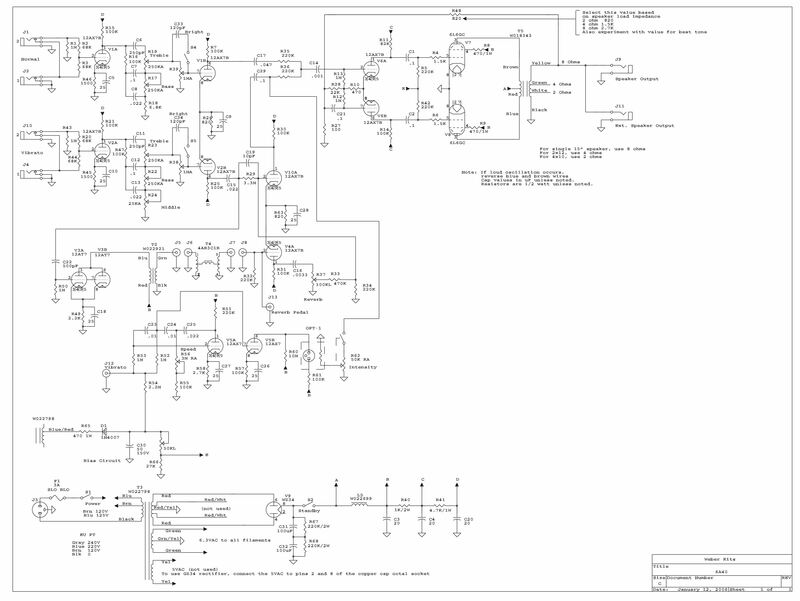 Build note: You must pay a lot of attention to heater wiring and ground layout if you want this amp to be quiet. Most of the effort in this build was getting those areas right. Read about grounding from Doug Hoffman at www.hoffmanamps.com and www.valvewizard.com and look at any youtube video you can about heater wiring. You don't do these things correctly I think you will have an unsatisfactory result. I used 18 gage solid core and tight twists for heaters. and made sure to keep heater wiring separated and tucked into leading edge of chassis and at 90 degrees to signal wiring. It is labor intensive and you need to pay attention to the polarity so make the insulation to keep the hookup consistent tube-to-tube. Grounding I did not use Weber Ground plane. I used a ground buss bar and grouped into three ground points for the whole amp. Amp is very quiet. The other things I did were to buy 20 extra 0.1mf caps and 20 extra 220kohm resisters that I carefully matched to get two of each for the phase inverter/driver. Trust me it takes that many to get two that match to the third digit. The spread was more than I thought it would be. Full tolerance range on both. I consulted Dan Torrres old book (pre-internet) and added a "Sizzle cap" 0.047 mf to the driver and I added a diode to the "C" power supply for the input tubes for a little extra rectification to make it a touch cleaner. I used 3 watt 470kohm metal oxide screen resistors and mounted them a little away from the power tube socket so they would run a little cooler. Speakers are great. The quality of the hardware is pretty basic. The capacitors are film caps similar to Mallorys, electrolytic are generics, the silver micas are generics, the resistors are all metal film or metal oxide and I think that contributes to the low noise. Cabinet, grill cloth and Tolex are fine for me. Sounds great and I think it will last.